This month, Sara Abshari and Eileen Jaskuta presented to a packed room this month at the AME conference, the largest lean conference in the world! The theme this year was "Get Engaged." Furthermore, Roxanne Rosendale and her team from the 5 East Med/Surg/Palliative care unit were highlighted in an article by Mark Rosenthal in the Fall issue of AME's Target magazine. 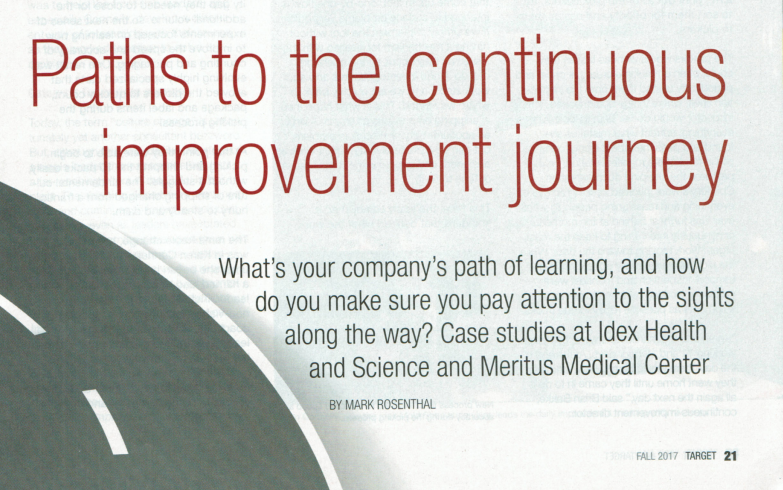 Hear about Meritus' six-year journey and how its approach evolved to achieve the true objective of lean - developing a people-centric culture of continuous improvement. Discover how it designed a small-scale experiment incorporating Toyota kata into the daily huddle on one of its nursing units and how the increase in nursing engagement convinced the CEO to lead an advance group of leaders for kata training at the University of Michigan. With the help of its lean sensei, the company had its official ‘kata kickoff’ with 20+ department leaders. Hear how its cadence is transitioning from monthly meetings and events, to daily coaching and senior leader rounding, allowing for a daily feedback loop across organizational tiers. Learn how the leader standard worksheets follow the same kata starting script used by improvement coaches. Hear how siloed problem solving is now nearly nonexistent as leadership immediately recognizes and coordinates units working toward a common challenge. Thank you Sara and Eileen for sharing your learning over the course of the year and good luck on your continued journey! Great work done by the OI team. It was a privilege to be part of the Meritus Operations Improvement team. Kata all the way :).